Note to Self is a 4-player minigame found in Mario Party 6. The name comes from a person letting him or herself know what not to touch, to stay away, or to hide from someone. 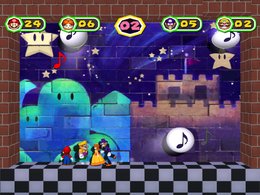 The minigame is set with a castle in the background and four walls as barriers for the notes. There are only aesthetic changes between daytime and nighttime. During the day, there is a rainbow in the sky background. At night, there are stars. The three notes fly back and forth as the players stand beneath them. 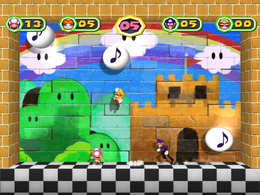 The main point of the game is to jump and touch one of the floating music bubbles. Once a player touches a note, a regular music note appears for a second as the character's color (red for Mario, and blue for Luigi, for example), and the player earns a point. Players can also jump on opponents to stun them for a few seconds as well as jump higher. Whoever hits the notes the most times after the thirty seconds are up, wins the minigame. This minigame appears as the fifth minigame in Decathalon Park. Here, the player's objective is to hit as many notes as possible to earn as much points as possible, up to a maximum of 1,000. The default record for this minigame in Decathalon Park is 10 points. As soon as the minigame ends, the three notes explode into smaller notes. The camera then zooms in on the winner, who performs their victory animation. Rules – "Hit the three bouncing music notes as many times as you can! Whoever hits the most notes wins!" Advice – "Jump on your opponents to hit high-flying notes!" French La meilleure note Can mean both "The best note" and "The best grade"
This page was last edited on March 27, 2019, at 00:17.